Stay dry and comfortable on the Golf course. Our carefully selected range of golf waterproof clothing feature gore-tex liners, sealed seams and high breathability fabrics to give you total weather protection. Shop from leading brands including Adidas, Nike, Galvin Green, Footjoy and others. Staying dry when you're out in the middle of a golf course is important to keep you comfortable. The last thing you want is a cheap waterproof jacket that leaks at the seams and traps your body heat and sweat. 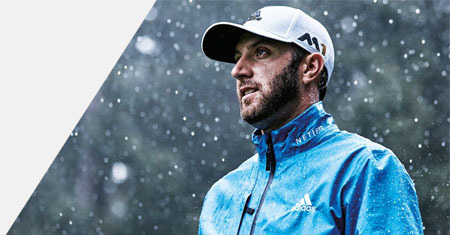 Our range of golf waterproofs that we have selected for you have features such as Gore-tex liners, sealed seams and high breathability fabrics are all developed to make sure these golfing jackets and trousers give you total weather protection.